In 3 1/2- to 4-quart slow cooker, place turkey thighs. In small bowl, mix salsa, water and taco seasoning mix; pour over turkey. Cover; cook on Low heat setting 7 to 9 hours or until juice of turkey is clear when thickest part is cut to bone (180°F). Remove turkey from slow cooker; place on cutting board. With 2 forks, shred turkey; discard bones. Return turkey to slow cooker; mix well. Cover; cook on High heat setting 15 minutes longer or until mixture is hot. With slotted spoon, spoon about 1/2 cup turkey mixture onto bottom half of each bun. Top with cheese, avocados, bell pepper and top halves of buns. Looking for a little heat? 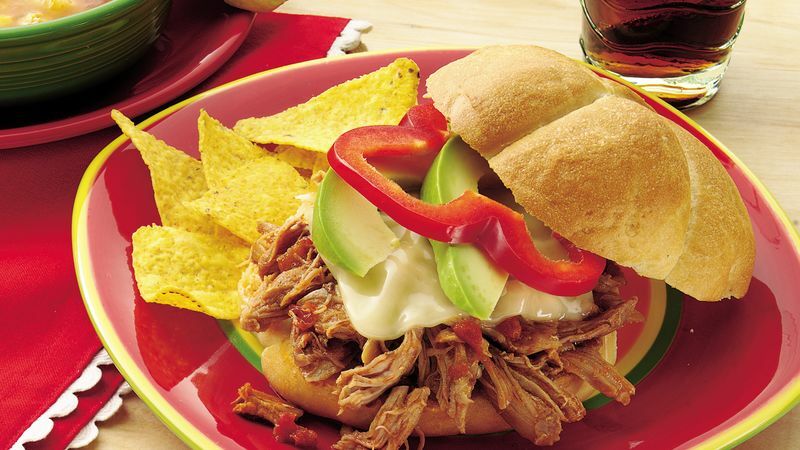 Use hot salsa and pepper Jack cheese to give these sandwiches a spicier kick.